We were just wondering when we'd get a new Assassin's Creed Odyssey trailer, and now here we are. This latest video emphasises player choice, something that Ubisoft has really been pushing based on what we know about Odyssey so far. You can choose your character, your style of play, who you romance, which army you side with, which missions to undertake, which weapons to use, which abilities to equip, and, of course, dialogue options. As you'd expect of a role-playing game, whole questlines can be altered depending on your actions, and at this point, Odyssey is definitely a role-playing game. What are your thoughts on this latest Assassin's Creed instalment? Decide not to be stealthy in the comments section below. 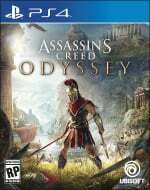 Ubisoft have been boasting about Odyssey having "over a hundred hours of content" I think Ubisoft have traded the annual release problem with a new one, overloading their games with repetition and filler to make it seem worth the value. @adf86 I agree with this. Even if I liked Origins, the side-quests and activities are underwhelming in AC. Looks like that you can build an army and recruit soldiers now, I’m not excited with this feature, especially after Shadow of War. Lol. Thanks to EA, "player choice" has been redefined as microtransactions. Graphically it looks mighty fine. I'll be getting this at some point, I actually quite like Ubisoft's open worlds.